Yesterday, we took this sweet gentleman with soulful eyes into our program. He is an absolute mess on the outside ... but what a truly sweet soul on the inside! Essentially, he came "home" to the farm where he will live out the rest of his days knowing love and being a part of a family. 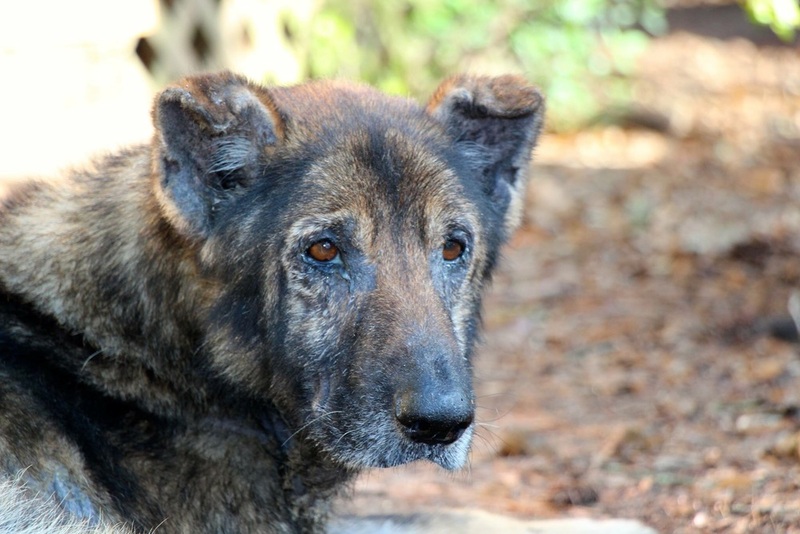 We don't think he has much time left as he has numerous significant physical health concerns. But we will manage his pain with medications and we'll keep his infections at bay with antibiotics. Welcome home Gus Jack ... you're a very good boy and we'll do the best we can for you during your time with us! Update: We knew that our time with Gus Jack would be limited when he came to us. We were pleased, however, that we were able to share almost a year with this gentleman. Despite being on numerous medications, when he became unable to to walk and stand without pain we knew that it was time to help this sweet guy pass. Gus Jack thoroughly enjoyed a pork dinner and our little girls sat with him while he fell asleep. Once he came home to the farm, he never left ... including during and after his final moments with us. Gus Jack, like all of our animal residents, now rests forever at the farm. We are grateful to have had the opportunity to know this sweet guy and we're happy to have been able to give him a much deserved second chance. Rest easy sweet boy.